ReactorPanel ® Saddles’ flexible panels and shock-absorbing discs follow the changing contours of the back in motion, allowing for constant contact which is what gives the superior stability when at ” Optimum fit”. The front and rear edges of the panels flex the most dramatically, because the shoulder and loin have the greatest articulation and movement, that is why the fitting is very important. In a similar way to a western saddle the panels are open and flexible front and rear with contact through the middle of the saddle, this allows the fitting of very close coupled horses in a way that could never be achieved with a traditional saddle, our customers with close coupled Endurance Arabians spring to mind. The saddles flexible panels undulate with the back under the center of the saddle, allowing the horses back to lift in response to the massaging effect of the panel movbement. Because they are independently attached, each panel can compress and flex on either side of the horse’s spine in response to the back in motion. When a horse is in motion, the scapula and the muscles and cartilage surrounding it rotate under the flexible panel. 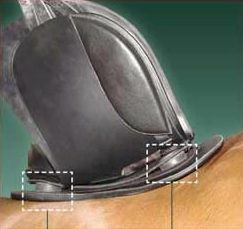 The shock absorbing, Sorbothane discs allowing the panel to lift.This provides more freedom of movement than a conventional saddle as the specially shortened tree points are situated away from the horse. This part of the panel is non weight bearing. In our experience your horse should demonstrate additional range of movement from new found shoulder freedom. If the saddle is fitted correctly horses often feel more relaxed and previously encountered behavioral problems frequently disappear during the 4 week trial. 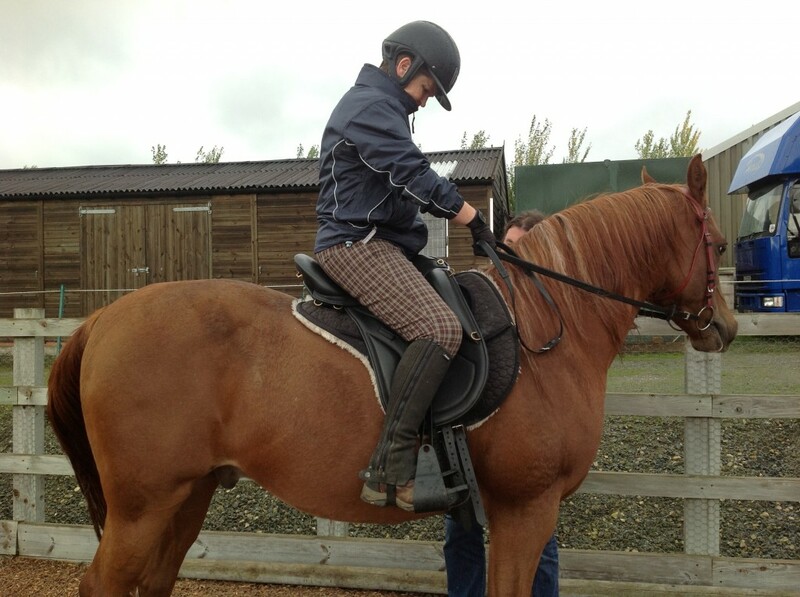 We often hear of customers who have bought saddles without even riding the horse in it! We do not recommend this as the saddle you think you may like on a website may not feel the same as you anticipate it will when ridden and it is common for customers to choose a different model than they expect during the saddle fit. Occasionally some customers also need a different shape seat or style of saddle when they undertake their the 4 week trial. We will discuss your requirements before your visit and are very experienced at advising which saddles to try, resulting in the right saddles for you to try on the day. However if the saddle that felt good during your saddle fit does not feel so good after an Endurance Ride, Cross Country course, Dressage Test or a 2 hour hack,we would like to speak to you as we are happy to come back with more options or even make you a special saddle if that is what you need. Return visits in relation to a new saddle fit are usually free of charge. 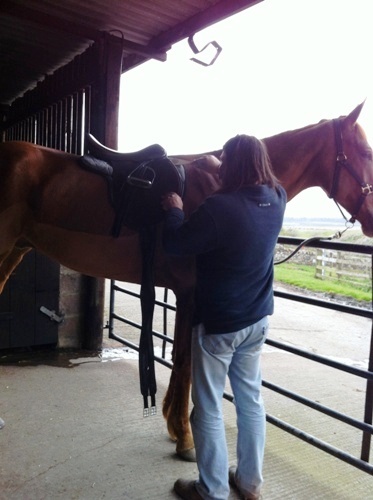 Your saddle will initially be assessed when your horse is stationary, but as for all other saddle fitting we will need to see you ride, preferably at least few strides of rising trot. The horses back changes dramatically when ridden so what appears balanced when stationary will appear very different when the horse moves, we also have to consider the horse’s muscle tone and the effect of the riders weight. The challenge in saddle design is retaining a superior fit on the moving horse and stability for the rider, this is achieved by the saddle at optimum fit, therefore fitting requirements are unique to the individual horse and rider combination which is why we recommend that the saddle is fitted by ourselves or one of our Accredited Agents. Dean Woodward Fitting a RP Saddle. The ReactorPanel Saddle fitting is very complex, even the smallest adjustment of a disc makes a difference to the fit , that is why we do not recommend you initially try and fit a saddle yourself without assistance from us or employ anyone who is not listed on our website to fit your saddle, if they are not listed on our website there’s a reason for why they are not approved by us! For our International customers where we do not regularily visit or in between visits where we do not have Accredited agents we are happy to provide support by phone, email and mail order. 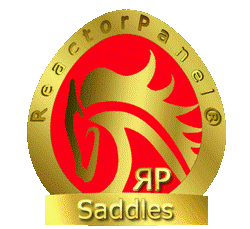 Please see our video on How to Set up you ReactorPanel saddle in default position and send us photos so we can give you advice if you are happy to have a go at adjusting your saddle yourself. Over a period of time muscle damage often regenerates and the horse changes shape, in most cases the saddle copes very well with these changes due to the flexibility of the panels, however it is advisable to have your saddle professionally checked by one of our Accredited fitters who can easily adjust your saddle on site should it be required subject to a call out charge. All our Accredited Fitters also carry replacement velcro and all sizes of discs with them but it is advisable to contact them in advance to ensure they have the correct size velcro replacements for your saddle in stock . I was just wondering if you have saddles in Australia – or do you send to Australia?